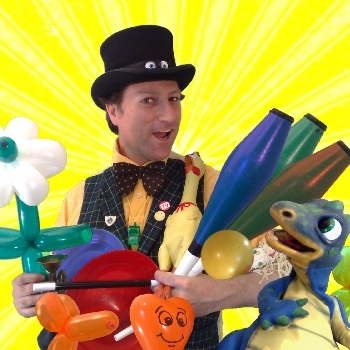 "Childrens entertainer for birthday parties"
At big and noisy events and venues GIZMO can bring his sound system, microphone and music, so no matter how big the crowd his show will be heard and enjoyed by all. GIZMO is a skilled and entertaining balloon modeller. 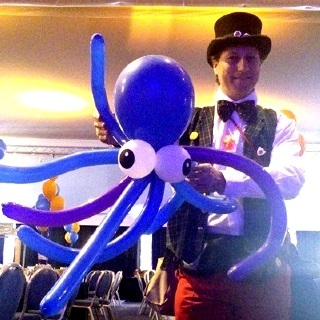 For small parties of 30 children or less he aims to make every child their very own special balloon model. 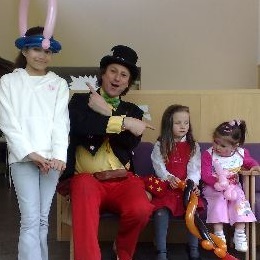 For larger events of over 100 children you can book him primarily as a balloon modeller and he'll work the room creating wonderful balloon models for the crowds. 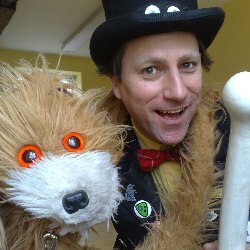 If you're organising a children's party or event, you'll want to book a really experienced and high quality children's entertainer. Someone who'll effortlessly take the stress away from you and keep all the children fully involved, entertained and excited throughout the whole of the party. 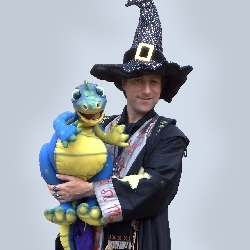 Book GIZMO for your children's party then relax, knowing your children's entertainment is completely taken care of by a performer with over 20 years experience entertaining children and families at birthday parties, theme parks, schools, holiday centres, shopping centres, cruise ships, family fun days and events and parties, large and small, just like yours! From the moment GIZMO arrives, the party has started. 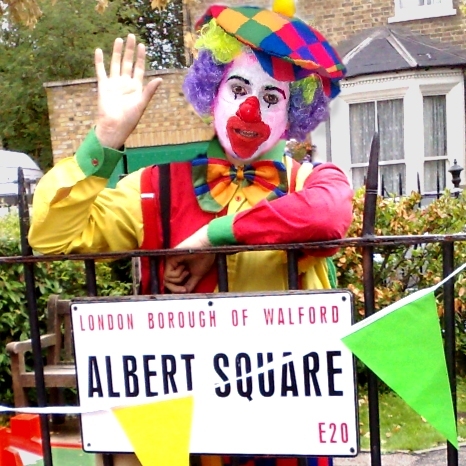 His wonderfully friendly, funny and silly charisma delights children of all ages. 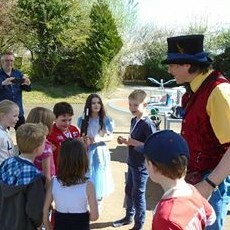 Then he's into his magic, balloon modelling and juggling, working the room thrilling all and expertly controlling the pace and energy of the party, so the children (and you) get the utmost from the party. 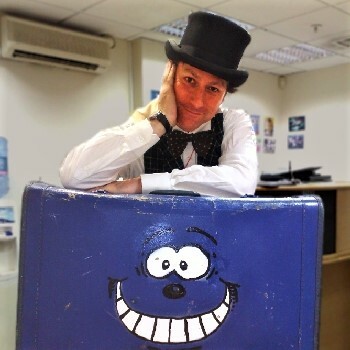 If you'd like a sitdown show, GIZMO can perform spontanious shows of any length as he or you see fit, or at any organised time he can effortlessly get the children together and perform the big GIZMO show, including lots of magic, involvement and lively excitement. GIZMO can perform a sit down show of any length from 10 to 45 minutes or longer. 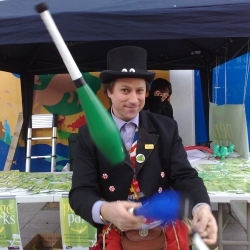 GIZMO can also lead the children in a whole host of lively and involving games, and for older children keep them involved with a fun and informal circus skills workshop. 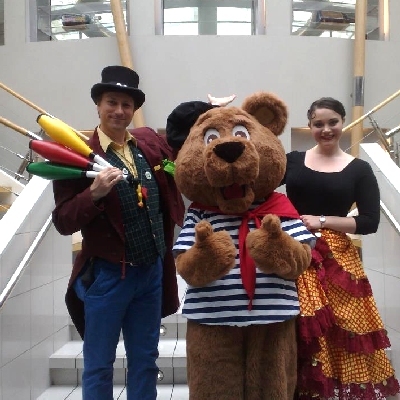 GIZMO has entertained audiences at Butlins, onboard Brittany Ferries, at Chessington World of Adventures and at hundreds of shopping centres and thousands of private parties from as few as just 5 children up to over 7000! And everywhere from Scotland in the north to Cornwall in the South. In short - whatever the age and number of the children, GIZMO will ensure that everyone is included and that everyone has an absolutely brilliant time. 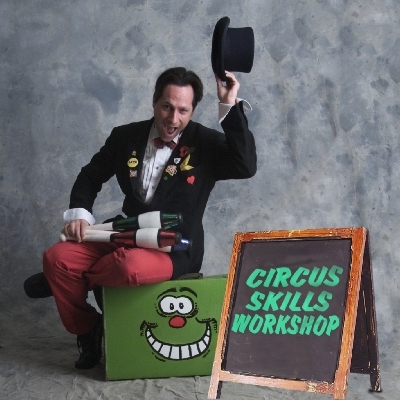 A member of Equity, the International Magicians Society and the International Jugglers Association, and with full performers liability insurance, GIZMO really is one of the best children's party entertainers in the country. No party is too small - Or too big! Give us a shout and tell us where and what date your party is and let GIZMO make your children's party GREAT! 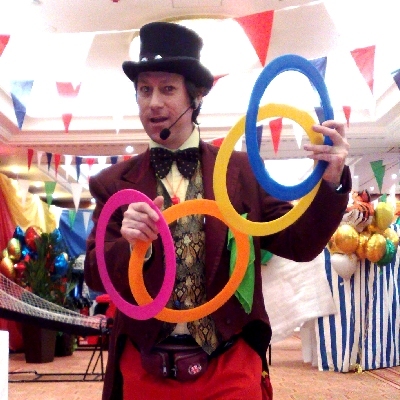 We also provide facepainters, balloon modellers, jugglers and magicians to make any children's party FANTASTIC! And if GIZMO looks familiar to you, you've probably seen him on TV! 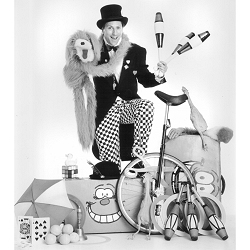 GIZMO has appeared on television programs including Blue Peter, Chucklevision, Basil Brush and many more, performing his magic, clowning and circus skills. "That's the most fantastic children's entertainment!" "We were also impressed by the way in which you entertained the very shy children, who could well have been left out, had it not been for your expertise."